This is the little one when she was 3 years old. 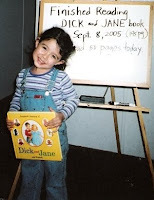 I proudly took a picture of her on the day she finished reading her 'real book'. Before this one she read other books but they're a lot thinner. This one was almost 200 pages that's why I just had to take a picture of her with the book. Just like a lot of other kids, she started showing interest in books because of the colorful pictures. Her love for reading probably started from that and partly because we made sure she actually tried to read the books we got her. 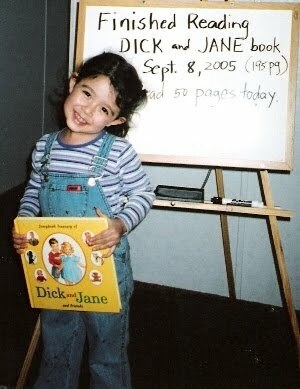 Fortunately, her love of books still continues up to this day. We got her a kindle so she now buys mostly kindle ebooks because of it. I still get her the regular books if it's not available in kindle yet. But for the most part, we use her kindle to purchase the books she wants to read. It's a bit cheaper and faster to get ~ as soon as you buy it ~ and we don't need extra space in the house to store them. I have to say Kindle is the way to go if you have a little one who likes to read as much as ours do.